Do you know The Story of the Easter Bunny? We all take for granted that little (or big) bunny that hops around to each and every house Easter morning. But where did he come from?? This adorable book tells the story of how the Easter bunny came to be…and why he visits little boys each and every Easter! This adorable book takes the classic ‘Twas the Night Before Christmas and turns it into an Easter bedtime (or daytime) story. If you, or your 4-year old, loved this Christmas rhyme, then this is the perfect book for you! It’s also a great opportunity to create another cute holiday tradition. I was so excited when I thought I came across a Dr. Seuss Easter book. Unfortunately, it’s not written by Dr. Seuss himself, but is inspired by his genius and thus is part of the Dr. Seuss Beginner Book collection – books that are perfect for beginner readers! It’s Not Easy Being a Bunny follows P.J. Funnybunny as he tries out being different animals in an attempt to find a better life. For 4-year old boys that already love reading Dr. Seuss, this book is a perfect Easter basket addition! My 4-year old son’s love of dinosaurs is surpassed only by his obsession with trains – and I know I’m not alone there! So it should come as no surprise that T. Rex Cottontail is absolutely ending up in my 4 year old’s Easter basket this year. This book features a dinosaur (T. Rex to be exact) who sets out to save Easter…one basket at a time! If you’ve got a dinosaur lover on your hands, this book is the winner! If you have a train-lover on your hands, then look no further than Thomas and the Easter Eggs! This particular Thomas book is part of the Little Golden Book collection, which is great if you already have some of those. 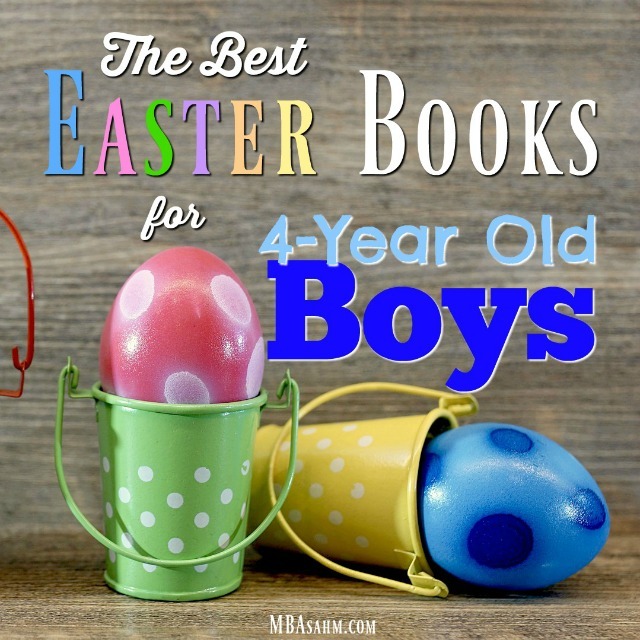 My son would be devastated if he thought I left out another Thomas Easter book, so two of them are showing up on this list! Easter Engines is different than Thomas and the Easter Eggs in two ways. One, it’s obviously a different story! And two, instead of it being a Little Golden Book, it’s a Step into Reading Book, which is great for 4-year olds that are just starting to read! If you’re looking for a good way to teach your 4-year old boy about the religious significance of Easter, God Gave Us Easter is the perfect way to do it! The story is adorable, sweet, and helps to understand what can be a complicated concept for little preschoolers. And if you fall in love with this book, there’s a whole collection of God Gave Us books that help to teach kids about the Christian religion. Danny and the Dinosaur: Eggs, Eggs, Eggs is another great Easter book featuring dinosaurs! This book is really fun and interactive and not only features a cute Easter egg hunt story, but also includes stickers, a poster, and cards. This is another great Easter basket idea for 4-year old boys that love dinosaurs! The Biggest Easter Basket Ever is an adorable book based off of it’s older brother book The Biggest Pumpkin Ever. So if your 4-year old loved that book, they’ll certainly love this Easter book. This book features two mice that need to learn to work together, teaching a great lesson about friendship and cooperation along the way. Obviously, these are great lessons for 4-year old boys which only makes this book even better! The Pups Save the Bunnies isn’t specifically for Easter, but if your 4-year old boy loves Paw Patrol, this is as close as you’re going to get! In this story, well…the pups save the bunnies! One really cool thing is that The Pups Save the Bunnies is a lift-the-flap book, which you don’t see as often in books for preschoolers, but it’s something they still love to do! Any amount of interaction will help to pull them into reading. 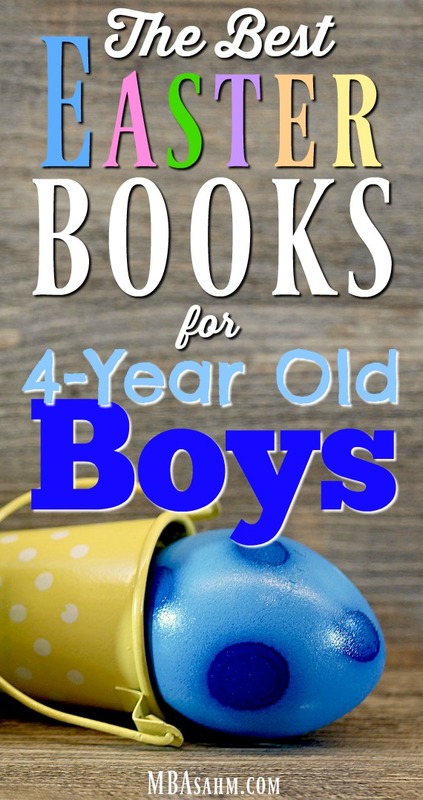 I hope this list of Easter books for 4-year old boys was helpful! I know for me it’s going to be really tough to choose between all of these books. Good luck with your Easter basket shopping and of course, have a Happy Easter!